AST WEEK I wrote about gregorio and GABC. There are so many developments happening that I’m sure I will be writing more about the system. This week Benjamin Bloomfield released a new Propers Tool for his collection of GABC transcription tools. and new this week: Propers! Not so long ago, I would transcribe by hand from the Propers of the Church year set to tones (1962 Missal) from Guam (it’s a great book, but quite hard to read). Then, once I found the transcriber, I would get the text of the propers from Maternal Heart and cut and paste the text into the Psalm tone tool, select a mode and repeat for each antiphon. Now the new Propers Tool makes it as easy as choosing the Sunday from a drop down list. 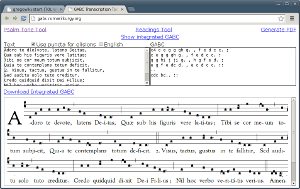 You can even select which ones to render with the full melody from the Graduale. The psalm toned Alleluia is rendered as in the simplified Alleluias in the back of the Liber Brevior, with the full jubilus and psalm toned verse. Clicking the PDF link in the top right corner takes you over to Illuminare Publications Score Editor (also written by Mr. Bloomfield) with all five pieces ready to process into a single PDF. One drawback is that there is no space for a translation, but there are a few ways you could add it in. There is a capability to insert text under the lyrics by enclosing the text in square brackets and inserting it between the syllable and the neume code. As is often the case with cutting edge software, the documentation is lagging behind a little, but there is good news there too. Gregowiki promises to be a treasure trove of helpful information. Already it has links to the tools I’ve already mentioned as well as tutorials and a handy cheat sheet.